Background: The combination of Fourier Transform InfraRed and levitation techniques, both on levitated water mixtures of Polyethylene Glycols (PEG)s and on wood finds, allows to follow the polymeric drying process as a function of time through the O-H and C-H stretching contributions and to investigate the wood thermal response. 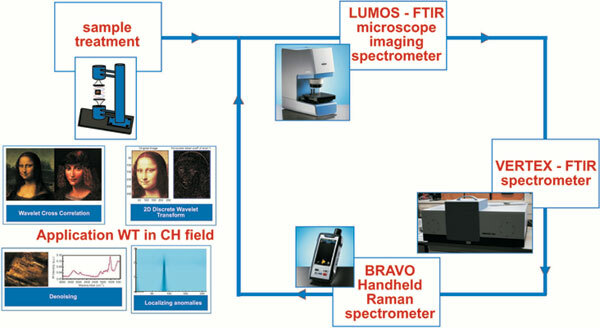 Objective: The aim of this paper is to report the FTIR investigations on wood fines, extracted from a 700’ dated wooden crucifix. Methods: At first, different acoustically levitated Polyethylene Glycol (PEG) aqueous solutions were investigated by FTIR in order to characterize the levitation induced dehydration process; then the wood fines, after having been treated by immerging them into the PEG aqueous solutions, were acoustically levitated and investigated; finally the treated fines were again studied by IR spectroscopy through a thermic cycle in the 25 ÷ 350 °C temperature range. Levitation technique furnishes an innovative approach to sample treatment allowing, in the case of solutions, to obtain highly concentrated mixtures starting from diluted solutions while, in the case of wood find treatments, to increase the polymer solution penetration within the wood matrix. Results: It clearly emerges that, in the PEG200/PEG600 comparison, the lighter polymer shows a higher effectiveness in terms of thermal restraint. Conclusion: Acoustic levitation, in combination with IR spectroscopy, reveals to be a very powerful technique in many applications concerning wood preservation and conservation. It clearly emerges that, in the comparison with PEG600, PEG200 shows a higher effectiveness in terms of thermal restraint. Acoustic levitation, infrared spectroscopy, polyethylene glycols, polymeric aqueous solutions, wood conservation, wood preservation, wooden monuments conservation.